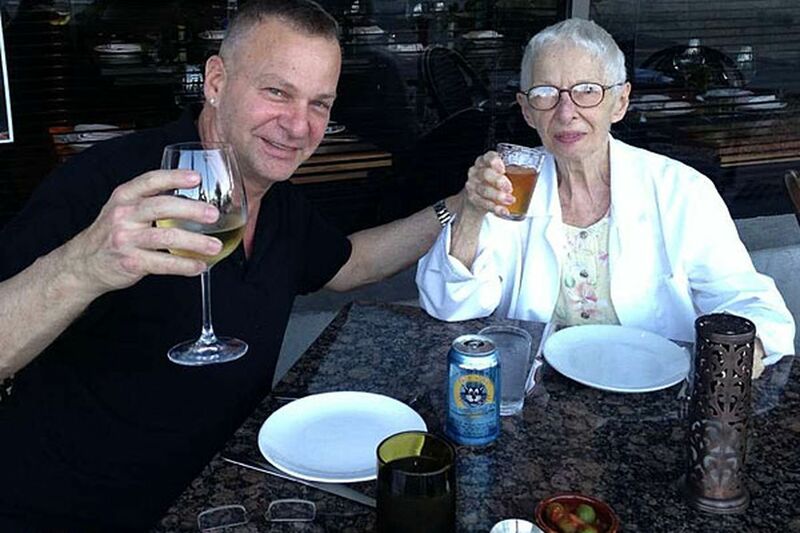 Lisa Scottoline's brother Frank, with Mother Mary (wearing her lab coat). Mother Mary went to the hospital this week, where she was probably the only person admitted wearing a lab coat. Tell Me About It: How does longing for a child or a mate differ? Chick Wit: Whole world's got problems, but first . . .
By the way, she's already home, so don't worry. I'll worry enough for both of us. We begin the story by telling you that last week, she was fine. In fact, my brother Frank sent me a photo of them both, out to dinner. And yes, she wore her lab coat, because I don't make anything up. I may be the author, but my family does all the writing. The day after they sent me the photo, I called Mother Mary to say hi, and she was enjoying a visit with her speech therapist, Dorian. You may remember that she has been having speech problems since her stroke, though she still curses like a champ. Mother Mary remains fluent in profanity. Thank God the best swear words are one syllable. Anyway, that's how I know she's doing fine. If I ask her too many questions about her health, she'll tell me to go to hell. Anyway, Speech Therapist Dorian comes to see her three times a week, and she adores him. She always tells me how nice he is to her, and she always does her homework for him, practicing her vowel sounds from flash cards, just to make him happy. Bottom line, Mother Mary has a crush on Speech Therapist Dorian. It's not therapy, it's dating. At least in her mind. This is especially so because he's Chinese, and Mother Mary has a thing for Asian men. Don't ask why, because I have no idea. All I know is that she always adored my father's old college friend Pete Ong. That was 60-odd years ago, and it never stopped. Pete Ong, wherever you are, call her. It's a sure thing, if you catch my drift. To stay on point, the first time she met Speech Therapist Dorian, she called me afterward and told me that he was Chinese, which is either his nationality or her code for super hot. Plus I've seen a photo of Dorian, and he is super hot. She may be 90, but she's still kicking. And she may have cataracts, but she ain't blind. In fact, she's so crazy about him that she put him on the phone with me when I called her last week. "Hi, Dorian," I said. "How's she doing?" "Great," he answered cheerfully. "Also, she wants me to tell you I'm Chinese." I'm not making this up, either. This actually happened, I swear. Mother Mary forgets I know he's Chinese, so she had to have him remind me. Now there's an aspect of old age nobody ever tells you about. Always, she was fine - until one day, she tells my brother Frank that some prune juice she drank "went down the wrong pipe" and now she's having trouble breathing. Thank God, he takes her to the hospital right away, because we both know that although Dr. Mother Mary has a lab coat, she lacks the medical degree. Anyway, she was admitted for observation and testing, and they found and drained some fluid from around her heart, which is no laughing matter. We know she has heart issues, though she has more heart than anyone I've ever known. So Brother Frank is keeping an anxious eye on her, and God bless the caregivers. He's a great son and brother, and she couldn't be in better hands. Nor would she want to be. Look for Lisa Scottoline and Francesca Serritella's columns in their newest collection, "Meet Me at Emotional Baggage Claim." Also, look for excerpts from Lisa's new novel, "Keep Quiet," in The Inquirer starting next Sunday.